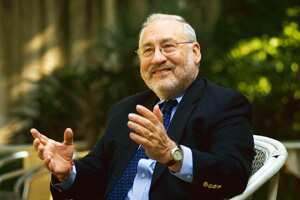 New Delhi: Joseph E. Stiglitz was awarded the Nobel prize in economics in 2001 for his pioneering research on markets with asymmetric information; his work has helped explain the cirumstances in which markets would work better with selective government intervention. Currently, he is the University Professor at Columbia University in New York. The 65-year-old former chief economist of the World Bank and member of President Bill Clinton’s economic team was in India this week. He spoke to Mint on a range of issues, including the rapidly eroding global economic outlook, the economic strategy of incoming United States president Barack Obama and how the current crisis was forcing a rethink in economic ideologies. 23cc7ad8-d107-11dd-a8e6-000b5dabf636.flv Is the worst over for the world economy? No. We are just in the downward part of the trajectory. I am focusing mostly on the United States, because that is where the problem began and until that problem gets solved the global economy is going to be in difficulties. United States is going to get worse before it gets better. The measures that are necessary to get us out of the downturn have not yet been taken. Everybody is waiting for (Barack) Obama to assume the presidency on 20 January; (the United States) Congress has to pass (the package), he has to sign; and, then the measures have to be actually put in place. That doesn’t happen overnight. So, I think we can see things probably getting worse for the next six months. That means the collateral damage to the rest of the world is likely to endure? So, then what is the outlook you see for emerging economies such as India and Brazil? I think the outlook is for a weak economy for a year-and-a-half, two years. I have three observations. Actually your (India’s) economy, in terms of fundamentals, is much stronger. There is an article, just the other day, in the International Herald Tribune, pointing out how lucky you were to have a (Reserve Bank of India) governor like (Y V) Reddy, who was criticized for putting on the brakes. But now everybody realizes that he was doing exactly the right thing. And, that means your banks are in much better shape. Obviously, when the economy slows down there are going to be problems; but their magnitude is so much less because you had a good bank regulator. Also, in the case of India your growth has been very robust; you have been growing at 9%. So you slowdown to 7%, 6%, 5%, it is still growth. In the case of United States we are talking about slowdown (turning) into decline; into a situation where the GDP (gross domestic product) is actually falling. The third observation is that there are lags that typically affect developing countries little bit later than Europe; so the weaknesses of the US economy are just beginning to be felt in many of the developing countries. Because what happens is that some of the effects are indirect; for instance some of the effects are because of commodity prices—commodity prices are falling because global GDP is falling. You, have to first slow down the GDP, before commodity prices start to decline. So, the dynamics of these are often complicated. Would this crisis lend a body-blow to world trade by stoking protectionist trends? No. I have very strongly criticized the WTO (World Trade Organization) that it has been unfair, but it still a rule of law. So yes the United States might want to raise tariffs and before the WTO.... The scope for doing that is much restricted. So, there will be a little bit of adjustments, but it will be relatively little. What is true is that this is not the time to go forward with many liberalization measures. But those were running into problems anyway, because the United States and Europe are not willing to cut back on their agricultural subsidies and developing countries say that unless you do what they promised why should we liberalize more. So, the liberalization agenda has run into difficulties. In a recent interview you remarked that this economic downturn will mark a realignment of the world economic order. Could you elaborate? After the Soviet Union fell, at that time state intervention was held to be the problem in the economy. There were principal-agent problems, misallocation. Now of course people say that it’s deregulation that has gone far. Do you think if state intervention is brought back in as it is being thought of in the US and elsewhere in the developing world, those problems would emerge again and how do we prevent their emergence again? Well I have consistently said that we have to find the third way. The communist system could not work and did not work. In fact I have given an analogy that what 15 September (the day the Wall Street collapsed massively this year) is in many ways to market fundamentalism what the fall of the Berlin Wall was to communism. 15 September marked the moment where it was very clear that market fundamentalism could not work. So I think most reasonable economists have said that we need to find a balance. That’s an ongoing struggle, an ongoing effort. It’s not a simple formula. The problem was that too many people looked for too simple a solution. No government or government does everything. In between is a much harder thing. Because we have to think whether this is a right thing or a wrong thing for the government to do. But in a way, it strengthens democracy because we have to have an ongoing debate on every issue on what is the right role for the state. It’s not just a question of too much or too little but also how it does it and what it does. For instance in the area of regulation, one of the things that I have argued is that we have to regulate incentives. To make sure the incentives are not leading to short-sighted, excessively risky, behaviour. Capitalism of the 21st century is not the same as the capitalism of the 19th century. In the 19th century, the model we had is that of the firms that were owned by a single individual. We had no problems of corporate governance. If he made a bad mistake, he bore the consequences. In the 21st century we have large enterprises, separation of ownership and control. The chief executives don’t own it. They own 1%, 1/10th of 1% or even 5%. So there’s always the problem of their trying to steal the money from the rest of the system for their own benefit. And that’s what has happened in the US and other countries. But a market economy can’t work if people don’t have trust. And so what I have been arguing is that you need a strong role for government to make sure that the rules of the game are such that the market actually works better. Do you think there are cycles of economic learning so that you learn from the past mistakes and dampen the effects of the mistake the next time there’s a crisis? Why is that that’s not in evidence now? We have the example of the Great Depression and now in this crisis we seem to be making the same mistakes. I think there are two reasons. One of the reasons is that memories are short. Part of this has to do with the education system that I have been very critical of. In economics, we don’t teach economic history. And so our students really don’t understand the Great Depression and the lessons to be learnt. There are people who are using the word “the new economy". Some people said that recessions are things of the past. I don’t know if you remember that in the end of the 1990s people were saying with the services economy we are not going to have any downturn. It seems absurd now but even less than 10 years ago very prominent people were talking that way. I think it is difficult for people, particularly if you don’t study history, if you don’t take an analytic approach.... Because there are changes but you have to figure out what are the similarities and what are the differences that it is often very difficult to take on board the lessons of the past. Your thoughts on one of the Obama proposals: pull up the economy by the bootstraps by investing in a green economy. Is this a smart idea? Yes I do. I think it is absolutely essential. The style of life that has dominated America is not sustainable. And so there has to be a change. There are just no two ways about it. With the growth in India, China, the growth in countries all over the world. They rightly say why should’nt we have the same standard of living that you have. But the planet won’t sustain it. So that means the burden is on the US and Europe to change their lifestyle to reduce their emissions. That has to happen. To change that requires a change, a fundamental change, in the way our society is organized. What does that mean? It means, for instance, not just going to more fuel-efficient cars. That we all agree on. But it is going to things like “how do we change the pattern of living and working?" So we have more people living closer to where they work. Cities with good public transportation systems rather than the car, which has dominated American life for the 60 years. So they are really fundamental changes. So these are big changes in that they require heavy investment in public transportation. If it works, it’ll be a dramatic change in America. It will have, I think, other profound effects on our society. People that live together, interact differently. You create more space for communal, collective action, a sense of community as opposed to when people are living in their own little acres. Scattered over, you weaken the sense of community. So I think there may be some very deep, profound, effects on the evolution of our society. That’s right and Obama has been quiet strong in saying that we need to have significant cut-backs in the level of emissions relative to the 1990 level. Numbers like 80% cut-backs. Now those are dramatic numbers because remember our economy’s going to be much larger than it was in 1990. So an 80% cut-back in emissions is not going to be feasible unless we have some dramatic changes. Which means that developing countries too have to revisit their arguments which they make as of now based on per capita emissions. That’s right. I mean already the developing countries are contributing about half of all emissions. The general principle is that developing countries should at least be allowed to emit the same amount as the developed countries on a per capita basis. If you were going to issue emission permits you might even say that it’s a property right that we’re creating. How should you distribute the property right? At the very minimum, the standard is equal per capita. Why should the rich get more of this property right? You could argue that they should get less for two reasons. One, they’ve polluted in the past. And secondly, if you were distributing any property right, if you had a new source of property, you would say let’s give more to those who are poor. So the issue of emission rights if we move in that direction of issuing emission rights, the minimum, is equal per capita rights. In many developing countries, economic reforms did not go far. By the time this crisis came, they were still trying to move in that direction. Do you think there is danger from vested interests, lobbies such as the protectionist and other kinds of domestic lobbies that just might stall reforms now that having the state back in is in fashion? What would be the consequences for economic growth? Everybody loves the word reform. I think one has to be very clear that all that the word reform means is change the form. The question is which reforms? And not all reforms are good reforms. Some reforms are always going to be necessary. So, for instance, the excessive deregulation was called a reform. Financial market deregulation was called a reform. That was a reform that had an enormous cost. What I think we ought to be doing is going back to the more fundamental issue that we were talking about earlier: What is the right balance between the government and the market? We need social protections, but we also have to have flexibility and we have to have a dynamic economy. One of the things I think we should be learning is how do we change the way we do things. So, for instance, in the US I have argued that globalization requires a larger role for the state in providing social protection. Companies like GE (General Electric Co.), General Motors, should not be in the business of providing health insurance. The responsibility of providing healthcare should be the role of the government. Somebody who is a good producer of cars is not necessarily a good producer of health programmes. So you can separate the two and you can have a more efficient economy by separating those roles. You are very right that there are special interests who will try to take advantage of this situation to push back on some of the reforms that are important, that are needed. I think the response to that is to come back to this basic issue that we need reforms but we have to think very carefully about what the right reforms are. In the case of trade liberalization, for instance, I always said it does not do any good to move people from low productivity protected sectors to zero productivity unemployment. That does not make any economy more efficient. If you have protected sectors and you have people, therefore of low productivity, you have to move them from low productivity, protected sectors, into high productivity export sectors. To do that you have to have financial markets that actually provide capital to new entrepreneurs. So you have to look at packages of reforms, identify where the problems are and move things. It means you have to retrain workers so that they can move from where they were to where they are going to be more efficient. So you have to think of these reforms in a broader sense … you see in the past too much of this ideology “markets can take care of everything". So we can get rid of protection and markets will create jobs. A lot of people said that. It did not happen and a lot of people suffered as a result and the economy did not grow. So if you do the other things, yes then you have a package, and that package can make the economy more dynamic and protect people. In this context, take India for example. It has had a fairly good run in the past five or six years. Yet it has accumulated a fiscal deficit of around 8% if you account it properly. This, in spite of reforms since 1991. Now in a time of crisis there are cries for larger spending that can endanger the economy. For a country like India it’s almost impossible to go in for US style deregulation. How does one manage reforms in a place like India? On the fiscal side I would like to highlight a couple of points. One of them is that there is a large need for public spending for instance for roads and infrastructure. One of the difference between India and China is the investment in infrastructure, education, technology and so forth. You can’t have those without tax revenue. Taxes have a cost. But the benefits of spending, if it’s well done, can outweigh the costs. Now one of the problems that India faces is that like many countries there are large elements of tax evasion. Maybe tax avoidance is the right word. People finding ways of escaping taxation. The so-called foreign investment is done through safe havens, secret bank accounts, deliberately to avoid taxation. One has to work to close those kinds of loopholes that would give you more revenue and that will create a more level-playing field, which leads to a more efficient economy. But the bottom line is that you need public spending, you need tax revenues to pay for that public spending and one way or another, you have to get that. Part of the deregulation mantra that has dominated the past 10 years was very much that high taxes depress an economy. Among the fastest growing countries of the advanced industrial countries and the highest performing in terms of wealth and broad measures of well-being are the Scandinavian countries and other European countries that have the highest tax rates. I asked the finance minister of one of these countries that you’re supposed to be a disaster with your tax rates so you should not be able to grow. He said we grow because we have high tax rates. Now what he meant by that was that not everyone loves high tax rates but because they have high tax rates, and fiscal responsibility is the only way they can finance the investments in education, technology and infrastructure that are the basis of their success. So I think this moment where we’re reexamining the role of the state, it’s not just a question of deregulation but this notion that smaller the state, the better. It’s just wrong. Philosophically, the Iraq war marked the end of the Neo-cons, and this crisis is marking the end of the neo-liberals. Are we now preparing for a long bout of Keynesian economics as you have argued that now everybody is a Keynesian? I think everybody now is going to be a Keynesian but there are different kinds of Keynesians. And the debates will be within the Keynesians. Some people will try to use the vocabulary of the Keynesians to re-get the special interest kind of legislation that they want without really thinking about the full depth of what Keynes originally talked about and the variety of thoughts in that framework. Let me give you one example. One of the things that Keynes was very concerned about was the notion of underconsumption, the lack of aggregate demand. We could view, for instance, that people are better off are more likely to save than people who are poor. If you give money to someone who is unemployed or someone whose income is very low, he’s going to spend it. If you give money to someone who is very well-off, he will save a significant fraction. One of the reasons the economy is weak today, I think, is the lack of aggregate demand. This in part is due to the growing inequality in our society. One natural response to this problem is to say, let’s try to redistribute income to those who are less well-off. Let’s try to design policies that create more equality and that will not only be consistent with principles of social justice, but will actually stimulate the economy. This seems to be an obvious implication of being a Keynesian. But there are many people who will not fully adopt this perspective. What do you see for a global currency. Will the dollar continue to be the global currency? I have argued very strongly that we need a reform of the global reserve system. That we need to create a multilateral reserve currency. Keynes talked about this, since you earlier asked if we were we all Keynesians now. If we were all Keynesians, we would be arguing for the creation of this global reserve currency. The dollar-based system is fraying. Right now the dollar is doing a little bit better. Even though the US is the source of the current economic crisis, people still believe the US government guarantee is worth more than a government guarantee from some small developing country. So if you had a choice between having your money in a bank in a developing country with a guarantee or money in a US bank with a guarantee, people say I will trust the American government guarantee. So it’s understandable why in the current context, the money is flowing back to the US. But that’s short-term, but in the longer-term the global economy will recover and the dollar will continue to get weaker given the huge deficits that we have accumulated and that will continue to contribute to global instability. The dollar is not a stable store of value and it will be very difficult to return as a stable store of value. And that’s why in the new world of globalization it makes so much sense to have a global currency. In this issue we have an SDR (special drawing right) of the IMF but its only been done episodically and the last one, the US vetoed. So in some sense what I am calling for is simply the SDR system but on a regular, annual, basis. We could also discuss a number of reforms in the details about how do you allocate the SDRs, how do you provide incentives to people for not to have surpluses, to make sure that we avoid global imbalances. But those are relatively small details that can easily be solved. The interesting thing is that parts of the world are already moving in that direction. There’s the Chiang Mai initiative, which is a mini forum of a global reserve system. It’s now being proposed to expand that to an Asia Monetary Fund. The Bank of the South in Latin America was discussed and its expansion to the global system. My perspective is described in my book, “Making Globalization Work".